One may think we only service Scottsdale by the name, in fact we cover all the phoenix area simply because our commercial customers have property all over the valley. 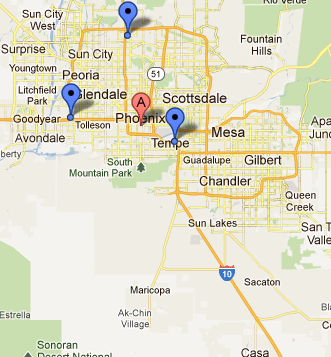 Although Scottsdale is our prime area, we go as far east to Apache junction and as far west as Buckeye and all the way to Maricopa and Casa Grande to the south. Thanks for that! It’s just the answer I ndeeed. I always want to be there when work is done. The olpbrem I have had is workers make it sound so much worse to the tenant, thinking the tenant will to push for the job. I just had a plumbing job and the plumber told the tenant he was going to have to cut holes in floors and walls and it was a hazard to her children. She moved out. He didn’t get the job. The next plumber had the whole house replumbed in 7 hours. No holes anywhere, but I still lost a tenant.